Take control of your window coverings, inside and out! Burns for Blinds have a variety of ways to control your motorised window coverings – look below to find the right one for your home. With Connexoon Window RTS, you now have the comfort and peace of mind to make life at home even easier! Connexoon Window RTS is also compatible with IFTTT (If This, Then That). Unlock the power of voice control via third-party voice assistants including Amazon Alexaand Google Assistant, to experience a smart home with an endless range of opportunities. 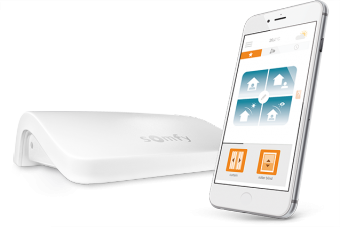 The Somfy Connexoon Window RTS system is suitable for controlling the motorisation of roller blinds, roman blinds, cellular shades, whisper shades, venetians and sunscreens inside the home. On the outside, control your external clear PVC blinds, shadeview blinds, roller shutters and awnings – straight drop, folding arm and alpha styles. The Smoove wall mounted control is available in three finishes for the display screen and seven contemporary frame colours to suit any décor. Each Smoove unit operates a single window covering, or a single group of window coverings. 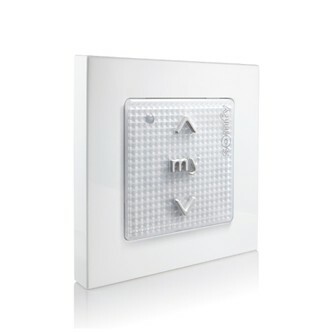 Somfy Smoove wall mount controls are suitable for controlling the motorisation of roller blinds, roman blinds, cellular shades, whisper shades, venetians and sunscreens inside the home. Put control in the palm of your hand and bring your home to life with remote controlled motorisation. Our remote control options all offer intuitive programming so they can be setup to suit to your homes specific needs. Control one or multiple window coverings – close a single blind or activate a suite of functions at the touch of a button. Window coverings can also be controlled with the automatic timer, giving you the ability to program different scenarios, which can be carried out on different days. For any type of blind with a tilting blade, such as aluminium venetians, the revolutionary central thumbwheel allows you to adjust slats precisely and swiftly. 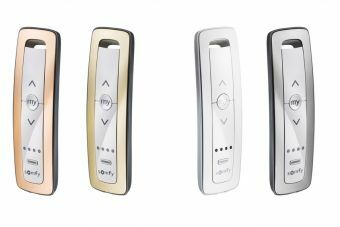 Remote controls are suitable for controlling the motorisation of roller blinds, roman blinds, cellular shades, whisper shades, venetians and sunscreens inside the home. Sun sensors – automatically lower your blinds or awnings as the level of sunlight increases, to help keep your home cool. Wind sensors – retract your outdoor awning if it gets too windy; or raise external blinds to prevent the fabric tearing. Indoor temperature sensors – adjust blinds or close shades based on a preset amount of sunlight and the inside temperature. Sensors are available for all Burns for Blinds motorised products.